Ambient air contains contaminants that are drawn into the compressor and concentrated during compression. Properly sized and selected, Kaeser air filters in conjunction with the right dryer will remove these contaminants. Whether it’s plant air, instrument air or breathing air, Kaeser offers a complete selection of application-specific filters providing a customized solution for all your compressed air quality needs. On average, ambient air contains about 190 million particles of dirt, hydrocarbons, viruses and bacteria per cubic foot. The majority of these contaminants enter the compressor and may still be present in the resulting compressed air. If the air is not properly cleaned, these contaminants can damage pneumatic machinery and air tools, or even wind up in the end product. 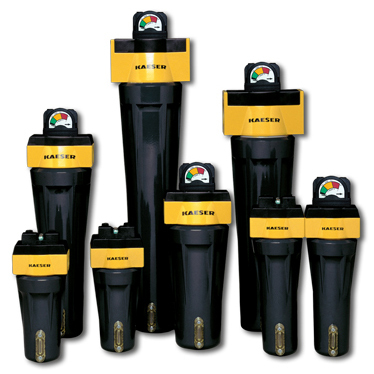 Kaeser offers a complete line of filters including: filtered separators, particulate filters, oil removal filters, extra fine oil removal filters and vapor adsorbers. Kaeser also offers a complete range of replacement filter elements to help keep your filter replacement schedule on target. These high-quality elements use the latest filter media technology and fit original manufacturer housings without the need for adapters or modification kits.